Eliminating new hum on a 2017 SE Custom 24, where does this wire go!? Discussion in 'PTC - PRS Tech Center' started by birds, Sep 8, 2018. Hello and thanks for looking at this thread. I'm brand new to working on guitars, but this seems simple enough that I should be able to solve my problem with a little education and my soldering iron. I've had this guitar since last March and it's been whisper quiet. Recently, maybe within the last 2 weeks, I started to notice a hum that I never heard before. I noticed that when I touched the strings it would drastically reduce, or sometimes when I had the selector switch in a certain position the hum would reduce as well. 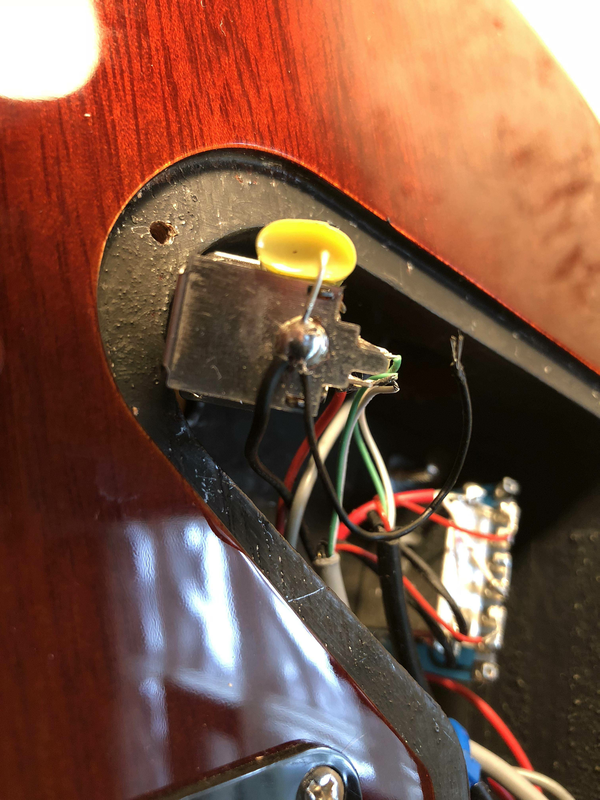 I also noticed that when I plugged in the guitar and the plug moved a little bit inside the guitar, I would get a very loud buzz for a second or so (different from what you get when you plug in a guitar normally). This could also happen if I just moved the guitar, but that was very seldom. Anyway, short story long, I opened up the control cavity and started poking around. 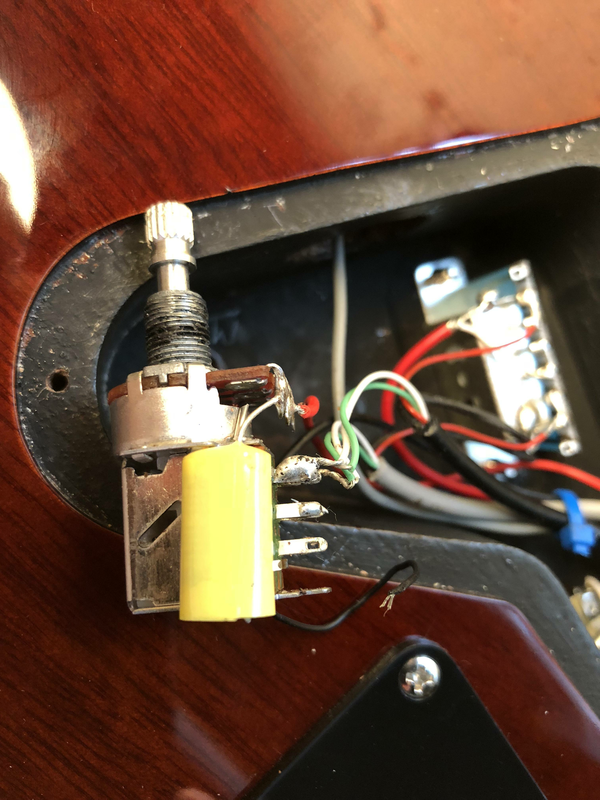 I found a wire soldered to the top of the tone pot, but it doesn't connect to anything. I've looked at a dozen schematics and I can't figure out where this thing goes. The wire is only long enough to go somewhere on the tone pot, or perhaps to the paint. I can't see any solder that isn't holding anything (no obvious place the wire broke). From looking at it, it's even possible that this wire was tucked under the tone pot and secured to the paint that way. Initially, the wire sheathing was covering the wire entirely (the end wasn't exposed), but the end of the sheathing was cracked and frayed. I've since stripped a bit of the sheathing off as you can see in the pictures. Can anyone push me in the right direction on this issue? Top picture. There's a glob of solder on the middle lug, but no wire. I'd bet it goes there. claythomas and Elliot like this. That glob is bridging that pin (the glob pin) and the pin directly across from it (directly behind it in the picture you are referencing). I can’t say for sure from the pictures, so this is just a thought, but perhaps the trem screw plate? There should be a solder point on there, which is also a likely source of the grounding problem you’ve described. Take the trem cover off, if there’s not a wire in there, you’ve found it. Well, this wire is only a little longer than the pot, so it couldn’t go far. It can’t reach anything but the tone pot. I tried connecting the wire to everything on the pot, one at a time, and nothing reduces the hum. I’m thinking the wire just connects to the shielding paint. I think it was just tucked between the body and the pot and then the pot was tightened to the body, connecting that wire to ground. This is just a wild guess, but the wire couldn’t reach anywhere but the pot, so the options are limited. By process of elimination, this is the only place I think it could go. Does this sound plausible? Is this “tucking” common? I know this wire probably doesn't reach the input jack, but regardless, have you unscrewed the jack and checked the solder joints there? Making sure the ground wire is solidly connected to a ground point somewhere in the control cavity. What I've done for now is re-soldered those connections at the input jack and checked the connections with a multimeter (input jack to strings, input jack to bridge, input jack to pots, input jack to humbuckers, input jack to control cavity shielding, etc.) and there is continuity everywhere. Interestingly the neutral wire (white wire) was sitting in the jack in such a way that a cable end could push on it, so I've moved that off to the side a bit. As I described above, I just tucked this mystery wire (the subject of my post) between the pot's lock washer and the control cavity wall. Not sure if that's what I was supposed to do, but thats where it is. When I finally screwed the pot back to the body, after all the above work, all the hum stopped and the guitar sounds perfect again. I'm sitting here paranoid that the hum will come back, but for now all seems good. 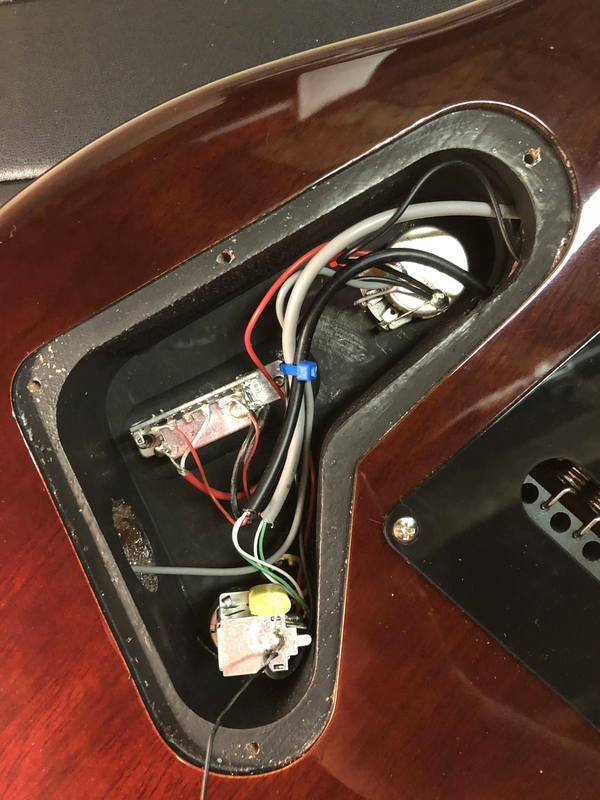 I guess the only way to know exactly where that wire goes is to see a picture of another control cavity from a 2017 SE Custom 24.
claythomas and Dirty_Boogie like this.